Everton's abject display in the Merseyside derby defeat at Liverpool left manager Roberto Martinez fighting a growing crisis that threatens his future. Martinez was already the subject of growing hostility from Everton's supporters before his popularity rating dipped even further after a lamentable showing in the 4-0 loss at Anfield. It is against his backdrop of rising discontent that Martinez has one last shot at redemption in Saturday's FA Cup semi-final against Manchester United at Wembley. Martinez not only has an increasingly angry fanbase to appease - although it may be too late for that after Wednesday's embarrassment - but a new billionaire powerbroker in Farhad Moshiri. Is Martinez's three-season reign all but over - or can he save himself in the FA Cup? And why has it gone so badly wrong for Roberto Martinez? Blue sky thinking or desperate delusion? Martinez's permanent positivity is his trademark - but to maintain it, even exaggerate it, during this dreadful campaign has led to widespread criticism and mockery from Everton's fans, although the pathetic nature of the capitulation at Anfield was no laughing matter. He wisely admitted the "embarrassment" of Anfield but has too often talked in glowing terms about performances that have left fans questioning whether they have attended the same game. The Catalan's consistent use of the word "phenomenal" to describe routine events is now a stick with which he is regularly beaten, along with lines such as expressing his "incredible, incredible satisfaction" with a goalless draw at Crystal Palace. The arrival of new majority shareholder Moshiri, who bought a 49.9% stake in February, brought this eyebrow-raising statement from Martinez when striker Romelu Lukaku was linked with a move away from Goodison Park: "Financially, we can compete with anyone in world football at this time." The problem for Martinez, and indeed Moshiri, is that this statement will be put to the test this summer should Everton's under-achievement continue and the likes of Lukaku want better things. BBC Sport pundit Chris Sutton received widespread support from fans on social media when, after the 1-0 defeat at Manchester United, he told BBC Radio 5 live's Monday Night Club: "He comes out and talks a pile of nonsense. 'We controlled the tempo' - is he mad? He's not watching the same game as everybody else and this is the frustration for the fans." Martinez's hyperbole was even the subject of a quiz in the Liverpool Echo evening newspaper - where readers were asked to match his gushing phrases to unnamed players. Gareth Barry was described as "one of the best English players ever" after the Capital One Cup semi-final first leg win against Manchester City while Tom Cleverley was labelled "one of the most sensational free transfers you are going to see in Premier League history" after victory at Stoke City. Defender Stones was backed after a poor display against Swansea City with the claim he could be "one of the greatest players England has ever seen". Various players have had the title of "phenomenal" bestowed upon them from Ross Barkley to Aiden McGeady - who flouted the billing to such an extent he is currently on loan at Sheffield Wednesday. This veritable blizzard of joyous news for Everton fans would ring true if they were competing for a place in the top four, which many believe they should with the squad at Martinez's disposal, rather than below mid-table with only four Premier League wins at Goodison Park this season. Where Martinez sees blue sky, supporters study the reality of results (especially the humiliation of a derby thrashing) and look at thunderclouds overhead, although even he will struggle to see the sun poking through today. When Martinez first arrived from Wigan in summer 2013 after winning the FA Cup but also taking them into the Championship, this outlook was regarded as a counterpoint to the perceived dourness of his predecessor David Moyes - now it has worn thin and has become one of the major criticisms levelled at him by an increasingly disillusioned fanbase. The draw with Southampton meant this has been the worst season at Goodison Park in the club's 138-year history. Everton have picked up just 17 points at home, with eight defeats, five draws and a meagre four victories. The victories came against relegated Aston Villa, plus Sunderland and Newcastle United, the bottom three, and a Chelsea side in decline under Jose Mourinho. Using three points for a win, Everton picked up 24 points at home in 1888-89 and 1957-58. They got 25 in 1896-97, 1929-30 and 1996-97. Their record of conceding 29 goals at home is joint second with Bournemouth - only Villa have a worse record having conceded 31 goals. If Everton lose either of their last two home games against the Cherries or Norwich City on the last day of the season, they will equal the record for most home losses in a season which came under Mike Walker in 1993-94, when they escaped relegation on the final day by beating Wimbledon and in 1950-51, when they were relegated. In Moyes' past two seasons at Everton he won 22 games and lost seven at home while in Martinez's last two - with two games still to be played - they have won 11 and lost 13. Martinez was a highly popular figure in his first season at Everton as they finished fifth in the Premier League with a club record points haul of 72, while playing flowing attractive football. The relationship has soured since the start of last season when Everton finished 11th and won only 12 games - and is now fractured to the point where it may be broken beyond any repair even before the FA Cup semi-final. Martinez's heavy-handed reaction to an interview given by Leighton Baines - arguably the most popular figure at the club - after the Premier League loss at Old Trafford was an example of how he has lost what was once a sure touch with supporters. Baines' assertion there had been a lack of chemistry in the team this season is borne out by results but Martinez revealed the 31-year-old had apologised and also claimed his words were "misinterpreted". Not only did this anger supporters who revere Baines and felt he was only speaking the truth, it also led to the Liverpool Echo to launch a passionate, detailed defence of its interview conducted with the England left-back - while heavily criticising the manager's response in an editorial. The aftershock was felt at Watford the following Saturday when a large "Martinez Out" banner was unfurled as well as one reading "Baines Is One Of Us". It was a PR own goal - not helped by Martinez allowing a succession of interviews from striker Lukaku casting doubt on his future to go without being similarly addressed. Since then, the atmosphere has grown more toxic. Martinez was pictured in discussion with one disgruntled fan at an under-21 game and a steward had to intervene to stop a supporter racing towards his technical area after Southampton scored in the 1-1 draw at Goodison Park. And then came the Merseyside derby. In a wider context, Martinez has been heavily criticised for flawed game-management and failure to cure Everton's defensive problems. Once again grim statistics pile up around him like rubble. Everton have conceded more points from winning positions than any other Premier League team with 18. Two-goal leads were lost at Bournemouth and Chelsea - and even when Everton regained the lead in injury time in both games they still were pegged back to 3-3. A 3-1 aggregate lead 25 minutes into the second leg of the Capital One Cup semi-final against Manchester City was overturned and in March a 2-0 lead at home to West Ham with 12 minutes left ended in a 3-2 defeat. It is a trend under Martinez. Last season Everton were joint "top" with Sunderland for teams losing points from winning positions with 19. And then there is the strange case of Oumar Niasse - Everton's £13.5m signing from Lokomotiv Moscow on deadline day in January. The 26-year-old Senegal striker's quality has become a matter for fevered debate among Everton fans, understandable on the basis he has only appeared for a grand total of 29 minutes in five different stints as substitute. In that short time he has looked lost and barely fit for purpose. This week Martinez said it would be a "bonus" if he figured in any more games this season as he still not ready for the demands of 90 minutes, a farcical state of affairs given his status at the third biggest signing in Everton's history. Not a lot to work with here but let's at least try. The criticism heaped on Martinez this season has been justified - but he still remains in with a chance of bringing Everton their first trophy in 21 years. He has also guided them to two domestic cup semi-finals for the first time since 1984. Even if he ended a barren sequence stretching back to the FA Cup win under Joe Royle in 1995, it is unlikely to placate many among the club's support who will now never be convinced by Martinez. Moyes was regarded as doing an outstanding job at Everton, taking them into the Champions League qualifying stage in 2005 and making the top eight in nine of his 11 full seasons. He never, however, won a trophy. The closest he came was when Everton were beaten 2-1 by Chelsea in the 2009 FA Cup final. If Martinez wins a trophy - and this is still a very big 'if' - might he not paint himself as more successful in terms of football's most valuable currency, namely trophies? It may now be his last salvation with the vast majority of Everton fans. This is why the stakes are so high for him on Saturday. 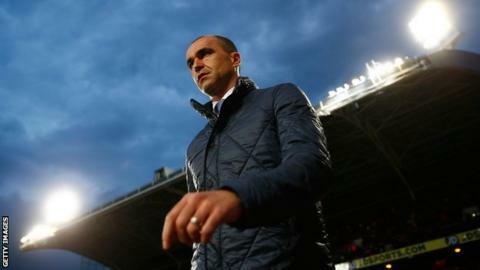 Will FA Cup loss end Martinez reign? Martinez is dealing with two treacherous areas for any manager - unpopularity with supporters, escalated even further by events at Anfield, and a reshaped Everton hierarchy with a new financial ambition in the shape of Iranian billionaire Moshiri. This is why the Wembley date looks increasingly like deciding his fate. Bill Kenwright remains Everton chairman but power now lies elsewhere. Kenwright's shareholding was diluted to 12.16% in the deal that allowed Moshiri to take a 49.9% stake in the club. Everton's other main shareholder is Jon Woods with 8.90%. The other 29.04% is held by 10,163 shareholders. So while Kenwright may yet speak up for Martinez, the real decision-making power must lie with Moshiri. And with talk of a transfer kitty reportedly in excess of £100m available this summer, will he trust his money to a manager who has guided what some regard as Everton's best squad for years into mid-table obscurity and oversees performances like that at Anfield? New owners tend to like their own choice of manager spending the money and Moshiri made his aims clear when he issued a short message to the fans in early March ending with the words: "Finally, and most importantly, Everton is about great football and winning matches." In the absence of both, Martinez is in deep trouble.